Minimum nursing staffing levels are needed to protect hospital patients from the impact of cuts in the NHS, a leading health union says. Unison called for the measure after an online poll of 1,500 midwives, nurses and healthcare assistants across the UK suggested services were under strain. It said nearly 60% reported they did not have enough time to deliver safe and compassionate care. The government said hospitals needed "freedom and flexibility" on staffing. The union said the government had missed an opportunity to implement minimum staffing levels - one of the proposals put forward by the public inquiry into the Stafford Hospital scandal, but not agreed to by ministers in their response last month. Some 45% of respondents, who were asked to report their experiences on one specific day, reported looking after eight or more patients. 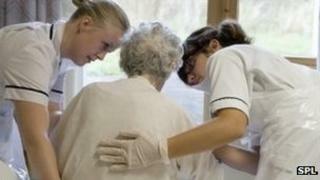 That is the threshold at which research suggests care suffers on general and acute wards. A fifth even described failings at their organisation as being on a par with what happened at Stafford Hospital. The release of the results comes ahead of Unison's conference which is being held in Glasgow next week. Nurses will also be gathering in Liverpool for the Royal College of Nursing's annual conference. The subject is expected to come up there as well. Christina McAnea, Unison's head of health, said: "This survey exposes a health service under severe strain, where nurses are struggling to deliver the high levels of care that they set themselves on a daily basis. "On this typical day many staff worked through their break and stayed after their shift - but this still did not give them enough time to complete all their tasks." The union said more work would be needed to establish what the exact staffing levels should be as they would need to be different on different wards. But Sue Covill, director of employment services at the NHS Employers organisation, said: "Every hospital has different demands on its services and we should be alert to the dangers of some one-size-fits-all approaches. "We believe arbitrary national minimum staffing ratios would limit how hospitals could plan resources in a way that's best for their patients." A Department of Health spokesman said: "There is no excuse for hospitals that don't have enough staff on the wards." But he added: "Hospitals need the freedom and flexibility to decide on how many staff to employ, because they know the care their patients need."